WOW Pam has done a beautiful job! 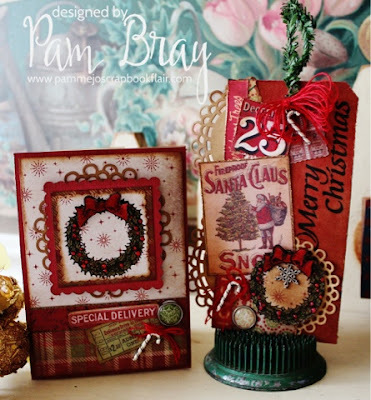 Both of Pam's designs are beautiful! 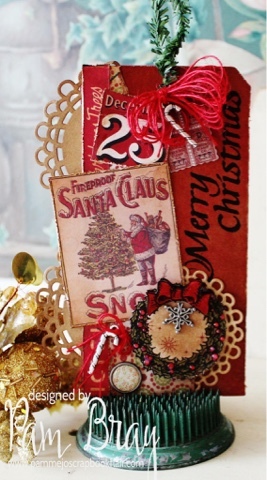 I love all the layers and details on her gorgeous tag! Lots of people are completely stressed out over Christmas, with so many things to do and going way beyond their budgets to buy gifts. For others who have lost loved ones, Christmas can be a very sad time. I would like to encourage those having a hard time. Please remember the true meaning of Christmas. It's about giving and spreading peace and joy. Cherish your memories and try to create new ones. For a non-monetary gift idea, how about a smile and "Happy Holidays" greeting to those you meet. Sometimes a smile goes a long way. It makes the smiler feel good, as well as the person seeing your smile. It's something I do year-round - I like to see how many people I can get to smile back! Very few don't! Happy Holidays to you and your team! That is so wonderful! It's true how a smile can t be the best gift we give. And the season isn't about money (although each year really seems to try to push that). Thank you for the wonderful comments! Amazing designs Pam!! Love all the layers! Pop over to tim's blog http://timholtz.com/mini-mason-jar-gift-ideas/comment-page-5/#comment-659199 for a simple and wonderful homemade gift idea. That's so wonderful. Thank you for sharing. I am just loving the spirit this is bringing! 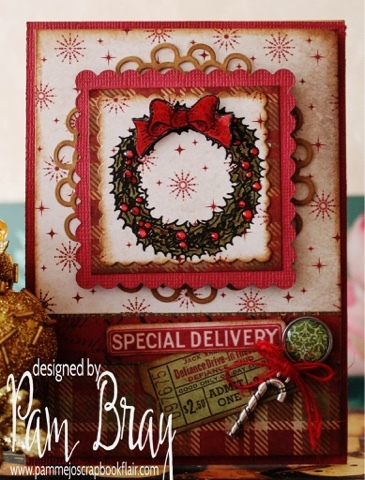 Gorgeous and festive fun designs by Pam! Speaking from experience of being homeless at 15-the best and most powerful "gift" I was given was a helping hand. Just stop and ask if someone needs help, offer to carry those grocery bags for a fellow neighbor, snow shovel a persons sidewalk even if it isn't yours, share that bagel in the morning, volunteer, take your furryand nice animal to an assisted living facility and share those sloppy kisses, and the biggest-listen and don't judge. Wow! What an inspiration and thank you for sharing it! What a brilliant Guest appearance, Pam! Thank you so much for being with us and for sharing these wonderful, inspirational and festive pieces with us! Ooh, Kim! 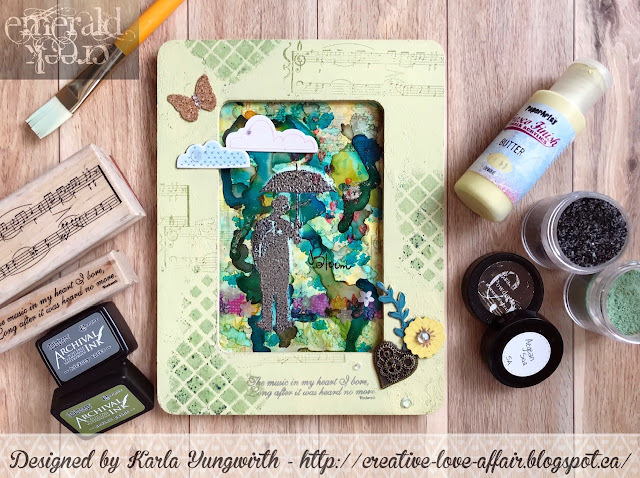 I love your grateful, giving heart, and what a lovely idea to offer ideas of positive encouragement! We receive so much when we give! I saw a woman at the post office the other day who had someone under her car hood-obviously mechanical failure had left her stranded. I told her how sorry I was that she was having trouble and asked if I could take her somewhere. She gave me a hug and thanked me, but it was me who was on the receiving end of that gesture. It brought tears to my eyes that someone could be so grateful for such a small token of encouragement. Love is all around, even in times of strife. A Christmas tradition we have on Christmas Eve is to rise early and get to our church at 6 am to prepare meals for homeless and homebound. Our kitchen at our church is filled with such spirit and love, and one man, George, heads it all up. He is in a thousand places at one time, smiling all the time. Many of the youth are here to help, and they sing as they work creating plates of food.Those that load up their cars with the plated meals bring back stories of homeless groups in the woods who thank him and offer Christmas blessings of their own. I cannot think of a more uplifting and wonderful way to spend time during the Christmas season. As someone who has suffered from our economic plunge, I can say there is so much more to life than having money--riches come from love and sharing! You're the best, Kim, to share this wonderful idea, and I know it will have a positive impact on those that visit your blog to reflect on the true meaning of the season! big hugs! PS I'm happy to say we were able to serve and deliver over 3500 meals last Christmas Eve! Oh Sara, you have such an awesome heart. Thank you for sharing and giving such a great service to others. Oops, in my excitement over your thoughts of true giving, I almost forgot to say Wow! to Pam for her lovely tag and card! Such beautiful vintage works of art! Merry Christmas! I am struggling this year too... just lost my Mom in October and I am missing her terribly. It will be a hard Christmas. But life goes on. I have a tree up and I will put some special ornaments on it that I got from her. I plan to invite my husband's Aunt Betty to have dinner with us, as well as my daughter and her boyfriend. Betty lives in an assisted living facility close by to us, and we visit her often. I think she'll love the outing and the opportunity to join us for part of our day. Denise, thank you. I sure hope the season brings you joy. And sharing it with Aunt Betty is the best gift you could probably give. Have a Merry Christmas and hopefully a wonderful new year smiles on you. A friend of mine did an awareness campaign for our local Women's Shelter, it was called the Sisterhood Purses. Over 70 purses were donated (gently used & some new) with a variety of items that these women may need as they enter the shelter this holiday season. Items included personal hygiene products to scarves, makeup and items for their children. Sadly most of these women & children arrive only with the clothes on their backs and these may be the only items they receive this Christmas. It felt so good to be a part of this fabulous "awareness campaign" and how our community came together. That's s wonderful idea. We do a lot of things like that in outer community and this is a wonderful way to add a new twist and refresh the donations given. When I was able to get out of the house I worked at the Christmas Dinner put on by a local church. Now that I can't help with the dinner I take names that people call in to be put on the delivery list. Anyone can request a meal to be delivered and there is no cost to the recipients. I also cook and donate a turkey or two or three and pies each year for the dinner and hubby delivers it to the church. I keep handmade cards in my purse that have coffee coupons, restraunt gift certificates ($1-$2 per card) or lottery tickets and when I go out for doctor appts I leave them in the waiting room or put the on car windshields for people to find! I love sitting in the car and waiting for the person to come back and open their treat! It is so rewarding to see the grumpy face turn to a happy one when they realize that what they thought was a ticket is a present! Sometimes the card I give someone is the only "present" they receive, and even if we can't afford to go all out, knowing I have made them smile makes me happy! Oh awesome idea! I'm definitely keeping this in my list of things to suggest when we plan service projects and random acts of kindness. Thank you so much for popping in and sharing. Merry Christmas! And the winner is.... On Instagram, Facebook, Pinterest and Twitter. Email you details for you CHA new release prize pack mailing on or about the 14th! After you select your stamp set! Congratulations to the winner! What an awesome thing you do to lift the spirits of those that need it most! And Kim, you are awesome to generously provide this gift to the winner! I hope we all continue to feel the spirit of Christmas throughout the year! XO I sent you an email too. Wow!!! That is awesome!! Thanks soooooo much!! That is VERY exciting!! Congratulations! You will need to email me your address so I can mail the package immediately following CHA!